I saw this on Margaret at Booksplease's blog, but I think she saw it elsewhere too. Regardless, you answer the questions with titles from the books you've read this year. Come on... do this... you know you want to! 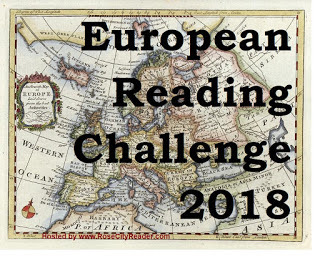 My second and final reading challenge for 2018 will be The European Reading challenge 2018 hosted by Rose City Reader. Read all books between January 1, 2018 and January 31, 2019. I like having 13 months so there is extra time to finish after the holidays. However, if you participated in the 2017 European Reading Challenge, you can only count books read in January 2018 for one year -- either the end of the 2017 challenge or the start of the 2018 challenge -- you don't get to count one book for both challenges. More info about rules and so forth to be found on the Sign-up page. I already have a load of books set in France to start me off, and Italy, it'll be difficult to choose just one but I'm sure I'm up to it. But I would also like to try and read something from more unusual countries, just depends what I can find. I thought maybe I'd not do any reading challenges in 2018. And then... as shiny new ones for next year appeared on my blogging reading list... I thought again. 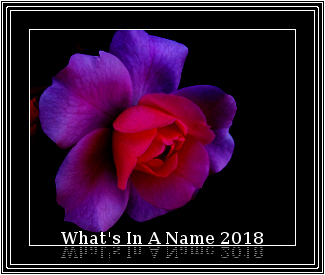 In fact I haven't done What's in a Name? for at least four years so I thought I'd give it go next year and see how it goes. The Challenge is being hosted by The Worm Hole and the sign-up post is HERE. The challenge runs from January to December. During this time you choose a book to read from each of the following categories. A Title that begins with Z (an be after ‘The’ or ‘A’). (I have nothing but I haven't had a proper look yet.) Suggested title, The Z Murders by J. Jefferson Farjeon. As usual I’ve tried to include some easy categories and some not so. Remember the titles I’ve given here are only examples, you can by all means use them if you want to but it’s not necessary. There are plenty of other books that will fit the categories and you may have some in mind already or even some on your shelves you can read. Books can be any format (print, audio, ebook). It’s preferred that the books don’t overlap with other challenges, but not a requirement at all. Books cannot overlap categories (for instance my example of The Square Root Of Summer could be used for ‘a shape’ or ‘a season’ but not both). The books I've chosen may change... plus I don't have one for the Z anyway. *But* I think it would be a useful thing to read those five books and get them off my tbr pile so I'll do my level best to read some of them. 59. The Road to Tholonet by Monty Don. To be reviewed but this was a lovely book with the Gardener's World presenter touring famous French gardens, but also talking about his life and what France means to him. Delightful. 60. 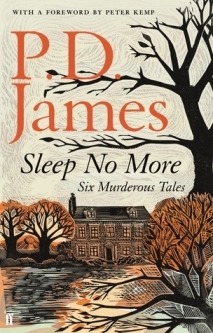 Sleep No More by P.D. James. Murder mystery short stories. Excellent anthology. 61. Printer's Devil Court by Susan Hill. One of the author's famous ghost story novellas. This one about a group of doctors in (I think) Victorian times who try to raise people from the dead. Quite atmospheric and nicely written. 62. 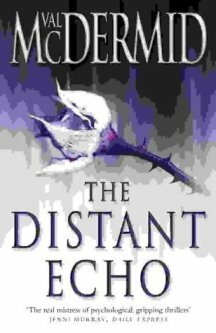 The Distant Echo by Val McDermid. The lives of four students are ruined when they stumble over the dead body of a girl back in the 1970s. Cold-case story. Very good. 63. The Wave in the Mind by Ursula K. le Guin. Non-fiction book of essays on writing and reading. Slightly underwhelmed by this. A few of the essays I enjoyed but many rambled on too much and I lost interest. One for the charity shop box. 64. Dear Susan: Letters to a Niece by Ben Hartley. Another non-fiction, this time by an artist who moved from The Peak District down to Devon to teach art in Plymouth. Ben Hartley went to live in a rural village and wrote letters to his niece that were illustrated with beautiful little drawings and full of interesting anecdotes. A totally charming view of life in a Devon village in the 1960s. So, six books is not bad. Truthfully, the first book was half finished I think before November started, and three of them were quite short books. So the six is not as impressive as it sounds! A favourite? Well, I liked Sleep No More by P.D. James and The Distant Echo by Val McDermid equally, very different books but both excellent. The non-fiction French gardens book, The Road to Tholonet by Monty Don, was also delightful. So, for once I don't think I'll pick an outright favourite. Very large jigsaw puzzles. 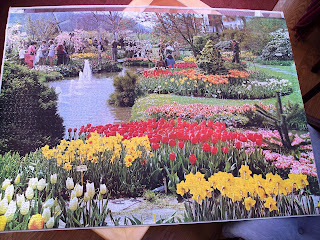 This one was 3,000 pieces, and a real pleasure to do, mentally challenging, which I find I need sometimes. So, here we are back in December again. I've no idea where these years go and am finding the speed that they fly by quite scary. Before we know it Christmas will be over, 2018 will here and another year will zoom by. Like I said, 'Scary'. 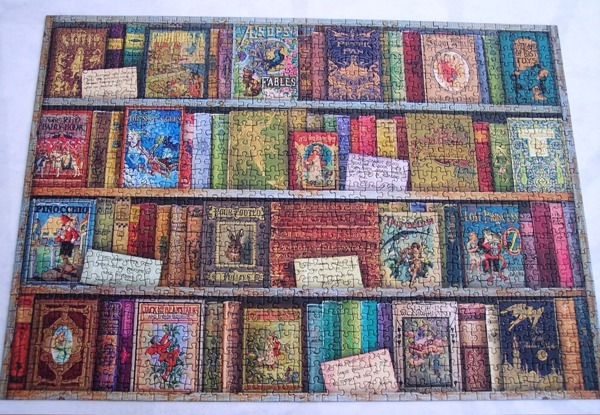 I see I haven't posted since the beginning of the month, that's because I'm jigsaw puzzling again and when that happens my reading gets slower. Anyway, two crime titles today, two very different books but both top-notch writing and enjoyable. First up, Sleep No More by P.D. James which is, I believe, the last anthology of crime stories the author wrote. There are six stories in this volume. 1. The Yo-yo. An old man finds a red yo-yo in a box of things which need sorting out. He remembers the Christmas it came into his possession when, as a young boy, he was driven to his grandmother's home instead of taking the train as per usual. In the car, one of his teachers, a man despised by all the boys at the private school. Something happens on the way there... An excellent story this, P.D. James gets nicely into the head of a boy with a strong sense of his own superiority. 2. The Victim. An assistant librarian marries an extremely pretty shopgirl. Before long she gets a new job, falls for her boss and leaves him. The librarian sets out to get revenge. Nicely told story with a good twist at the end. 3. The Murder of Santa Claus. Another schoolboy story with a Christmas theme. The boy concerned, Charlie, is sixteen this time and sent to spend Christmas with a step-uncle. Various people are present, strangers, so he's not comfortable at all and his uncle's oddness adds to the boy's unease. It seems the uncle like to dress up as Santa and visit his guest's rooms at one in the morning. But more than one person is abroad in the dead of night and when the uncle is found dead the next morning there are quite a few suspects... Another good story with quite a creepy atmosphere. I liked the 'anyone could have done this' aspect and had no idea who'd done it until the end. 4. The Girl Who Loved Graveyards. A ten year old girl is taken to live with her aunt and uncle after some kind of trauma but she seems to have blanked it from her mind so the reader has no idea what it is. Next to the house is a graveyard and the girl becomes obsessed with it. As she grows up she also becomes obsessed with finding her father's grave and sets about this task when her aunt and uncle emigrate to Australia. I think this was the best story in the book. It's nicely written and recounted, beautiful detail and a nice twist at the end. 5. A Very Desirable Residence. Harold Vinsom is on trial for attempting to murder his wife, Emily. The narrator of the story is a fellow teacher who is one of the few friends the married couple have. He observes that he hadn't known them very long before he realised that Harold was a sadist, subjecting his timid wife to constant verbal and mental abuse. So it came as no surprise when he learnt of the attempt on her life by her husband. Nice twisted little story this, very good observations of a marriage turned sour. 6. Mr. Millcroft's Birthday. A brother and sister, Rodney and Mildred Millcroft, are driving down to spend some time with their father on his birthday. He lives in a retirement home but is not happy there - he wants to move to another, more luxurious and relaxed place. There's plenty of money, he's given his fortune to these children, but they're being mean and keeping him in the cheaper, more regimented, place. During a picnic lunch Mr. Millcroft suddenly announces that he killed his brother who was about to change his will, leaving the famly fortune elsewhere. But is he telling the truth? Nice vein of humour running through this story. I like the vengeful father getting his own back on his selfish adult children. This small volume of crime based short stories is excellent. Each one is very individual, very well told, and a joy to read. The writing is absolutely superb. I liked it so much I bought another of P.D. James' Christmas short story collections, The Mistletoe Murder and other stories. The Distant Echo by Val McDermid, my book 4 for Peggy's Read Scotland 2017 challenge. It's the late seventies and four male students from the university of St. Andrews are making their drunken way home in the early hours of the morning. One of them, Alex Gilbey, falls into an ancient Pictish burial site and discovers the body of Rosie Duff, a local girl who works in a popular bar. The boys are immediately prime suspects for the murder, but the police can find no real proof, despite the boys' movements that night being a bit suspicious. Mud sticks and twenty five years later this one accidental discovery has basically ruined their lives in one way or another. And then one of them dies in a house fire followed by another dying in suspicious circumstances. The police reopen this cold-case but Alex fears that if he doesn't surrepticiously help, then the remaining two of the original four will also die. Margaret at Booksplease has been reading this Val McDermid series and inspired by her I thought I would try this, book one, of her 'Karen Pirie' series which are, I believe, all based on cold-cases. The surprise for me was that Karen Pirie was not in this book a lot, the centre of attention all the way through was the four boys. I'm thinking this is perhaps an introduction sort of a book and perhaps she'll feature more in future books of this series. Anyway, regardless of that, this was an excellent read. Quite complicated, quite a lot of people to keep tabs on and a lot of history of the original case to get through before it was brought up to date for the reopening of the case. I must confess here that I guessed the culprit quite early on. Of course, I didn't know if I was right so the books was not spoilt... to be honest it's so well written and so much in it that it couldn't be spoilt anyway. Possibly this book is not for everyone. The exploits of four uni students in the seventies are a bit eye-rolling and, if I'm honest, none of them were really likeable, not awful, but not terribly sympathetic characters. But I didn't mind that, I got very involved in the mystery aspect and the deatils of the investigation, and enjoyed the book very much indeed. 57. 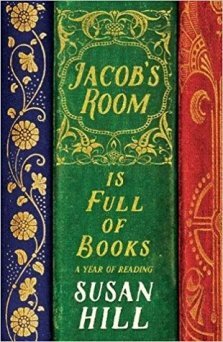 Jacob's Room is Full of Books - Susan Hill. I'm not a huge fan of the author's crime novels, but I do think she writes a cracking good ghost story and I do enjoy her non-fiction (The Magic Apple Tree is delightful) especially her books about books. I love Howards End is on the Landing, read it several times, and enjoyed Jacob's Room is Full of Books just as much. It's written on a monthly basis, covering one year, and meanders all over the place with bits about the countryside, the weather, the author's life and yes... books! Very enjoyable, even though I sometimes did not agree with her opinions. 58. 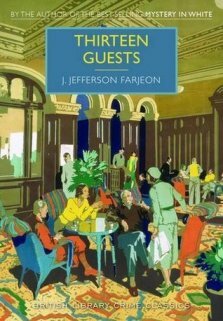 Thirteen Guests - J. Jefferson Farjeon. This is your classic Country House Mystery, the house concerned being Bragley Court. Lord Aveling invites twelve people for a weekend house party and they are joined by Jon Foss, a stranger who had an accident on the platform of the railway station, and was brought to the house by one of the female guests. That makes the number of guests thirteen of course, 'unlucky for some'. Foss is a keen observer of various shenanigans and then two dead bodies turn up and things turn interesting as the police are brought in and secrets are slowly revealed. This crime yarn was excellent, quite pacey once it got going, interesting characters - I always find 'motive' the most interesting part of a mystery like this and this one didn't disappoint. Very much of its time (the 1930s) but I'm always intrigued how these books often illustrate the old saying, 'The more things change, the more they stay the same'. Another excellent BLCC book. 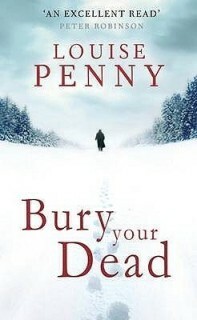 This was a brilliant instalment of Louise Penny's Armand Gamache series set in Quebec. Loved the snowy Quebec City and Three Pines setting, the library, the history... it was perfect. Five stars on Goodreads, no quibbling. This is book two in Marie Brennan's 'Lady Trent' series of fantasy books. In book one A Natural History of Dragons we saw how Isabella Trent grew up to love dragons, married, and then inveigled herself onto her first field trip to Vystrana (Russia?) to study dragons. In The Tropic of Serpents she's off again, this time to the country of Bayembe on the continent of Eriga, which I fancy is this alternate world's version of Africa. She's off to study swamp-wyrms in the company of Tom Wilker, who went with her before, and Natalie a runaway heiress. Bayembe is hot and humid, difficult, not only politics-wise, but also in the matter of femininity... things are very different for women here as opposed to Scirland where Isabella comes from. But most difficult of all will be living and surviving in The Green Hell, the swamp and forested area where she must go to study her dragons. This was a bit of a slow starter but picked up nicely as it went along. For me the most interesting aspect of these books is the travel. They read like Victorian travelogues quite honestly and as I love those, these books work for me. They might not work so well for people who don't like that kind of thing. I don't always find Isabella a particularly sympathetic character, perhaps I'm not meant to as she has to be tough in order to do what she wants with her life, ie. study dragons. The other thing I would say is that although these books are about the study of dragons, they don't actually feature dragons that much. Possibly this will come in later books. I liked these two books enough to order book three... after that, well, we'll see. Armande Gamache is staying with a friend, Emile, in Quebec City, the old part, recooperating from a distastrous operation that went wrong. We're only told the whys and wherefores of this gradually as the book progresses. He's spending time doing some research in the Literary and History Society library, a place very few people know exist because it's run by the English of the city, not the French. When the body of Augustin Renard, a prominent French researcher into the whereabouts of the remains of Samuel de Champlain, the founder of Quebec, is found in the basement of the library the city police ask Gamache for his help. Meanwhile, back in Three Pines, Gamache's last case (from the book The Brutal Telling and you do need to read that book before this one) is still festering. Olivier's partner, Gabri, does not believe Olivier murdered the hermit in the forest. Gamache asks his sidekick, Beauvoir, also injured in the operation that went wrong, to go to the village and quietly investigate. If this all sounds a bit complicted that's because it is... *but*... it's not at all difficult to keep track of. There are three cases going on here, that of the body in the library basement, that of Olivier - is he guilty or not? - and that of the operation that went wrong. It's brilliantly executed in my opinion, it all knits together perfectly and for me is one of the best Gamache books so far, if not the best. I loved the library and its English board of trustees. I loved learning about the antipathy between the English Quebecois and the French, sad though it seems to be from the point of view of an outsider. The details of the history of the Battle of the Plains of Abraham were fascinating - I learnt about it at school of course but it was nice to hear more. I loved the whole mystery surrounding the body of Champlain and where it is. And of course the settings are marvellous. Quebec city sounds wonderful and I love, love, love the Village of Three Pines deep in the Canadian forest and want to live there... along with thousands of other fans of this series I suspect. A fantastic series which gets better and better with each book. Almost three quarters of the way through the year and autumn is officially here: my favourite time of year. I'm doing this Where Are You Reading? update now instead of at the end of the month because my husband will have his second knee operation next week and for a couple of weeks after that I may not be around very much. I'm guessing there won't be much reading going on either but I may be wrong. Sooooo, that's 20 letters filled, 6 to go: B J R X Y & Z. I'm currently reading a book for B, leaving me with 5 letters to find books for before 2018. R shouldn't be a problem but the rest could be slightly problematical. I have a book set in Zimbabwe on my Kindle I think but we'll see what else emerges for the rest. Quite pleased with some of the destinations... various lovely US States, nice parts of France, Canada, Scotland, England and so on. Possibly I should vary the countries a bit more but those are the places I like reading about so it's a very much a list which reflects me and I can't think that that's really such a bad thing. I'm also pleased with the books I've read... there're some excellent titles on that list. I seem to spend half my life writing 'catch-up' book posts. These two couldn't be more different... I often look for similarities when doing multiple book review posts and it's fun when I find them, but there are none in these two - a non-fiction travelogue and a vintage whodunnit. 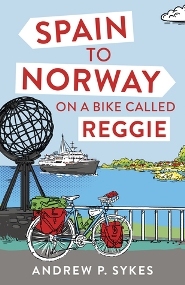 First up, Spain to Norway on a Bike Called Reggie by Andrew P. Sykes. I saw this one on Goodreads, someone I follow reads a lot of travel books so I pick up loads of recs from him. I gather this is Andrew Sykes's third travel book, trust me to start on the last one but I honestly don't think it matters at all. He decides to cycle from the most southerly tip of Spain, Tarifa, to the most northerly tip of Norway, Nordkapp. This takes him through Spain, France, Belgium, Germany, Denmark, Sweden and Norway. My kind of book... I like cycling travelogues and have an interest in most of these countries, especially France, Sweden and Norway. The author is very good at describing the landscapes he's travelling through but not overdoing it with a load of purple prose. Naturally he meets a lot of different people. I sympathised with him over the English cyclist he met who was only interested in talking about himself and didn't ask a single thing about Sykes's journey: we all know people like that. He did, however, meet some really nice people including a German father and daughter who were friendly and helpful... although another lone German cyclist, Helmut, was a terrible misery and bore and Sykes had trouble avoiding him. It only goes to show I suppose that all kinds of people take to the road on bikes for all sorts of reasons, just like all walks of life. An excellent travel read and I'll definitely be searching out Andrew Sykes's other two books, Crossing Europe on a Bike Called Reggie and Along the Med on a Bike Called Reggie... especially that Med one. Naturally, Devon Libraries hasn't got either. 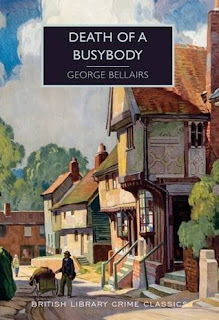 Lastly, Death of a Busybody by George Bellairs. Miss Tither is the village busybody in the English village of Hilary Magna. Nothing and no one escapes her interfering attention and religious zeal. Straying husbands, courting couples in the woods, athiests, all come under her scrutiny and are told to mend their ways according to the dictates of The Bible. When her dead body is discovered in the vicar's cesspit, no one is very surprised and the list of suspects is a long one. Inspector Littlejohn from Scotland Yard is called in to help the local constabulary discover exactly how many pies Miss Tither had her finger in and which of them helped kill her. This British Library Crime Classic was an excellent whodunnit. The large cast of characters was at times difficult to keep track of but I managed well enough. The quintessential English village was a joy even if we weren't actually told which county it was in... pedants like me need to know these things! The gorgeous cover is from a railway poster of Suffolk and the accents portrayed seemed to back this up although Hilary Magna sounds more Somerset than Suffolk. Never mind. I had no idea until the end who the culprit was, this was mainly because this was a complicated little plot with revelation after revelation as you went along, keeping you constantly guessing and changing your mind. Clever. There's also a nice vein of humour running through the story, always a plus. I wouldn't mind reading more by George Bellairs, he was apparently a Bank Manager in real life who wrote over 50 books, most of them about Inspector Littlejohn. I know the BLCC has one other volume available, a double book edition entitled, The Dead Shall be Raised & Murder of a Quack. That sounds like as good a place to start as any. It's pretty much autumn here in the UK, my favourite time of year. Hope you have some good autumnal reading matter to keep you happy. My first review of September is actually the last book I read in August. It's The Caves of Périgord by Martin Walker. Lydia Dean works for a London auction house as an expert in prehistoric art. Things are not going too well with her job, she's not getting enough customers in and thus not enough publicity for her employers. A piece of prehistoric cave art, 17,000 years old, is brought to her - the owner, Major Phillip Manners, has just inherited it after his father's death and wishes to sell it. It appears his father fought with The Resistance in France during World War 2, and must have acquired it while in Périgord, near the Dordogne in southern France. But where? It's a smallish piece of rock and doesn't resemble anything found so far in, for instance, the Lascaux complex of caves. An expert is called in from France but before the cave art can be studied it's stolen from the auction house. Lydia and Manners set off for France where they believe they can find people who knew Manners' father during the war and might be able to shed some light on the origin of the piece. In the Vézére valley in around 15,000BC a young man, Deer, an apprentice artist, is smarting after being falsely accused of an accident in the caves where his male counterparts are painting the local wildlife. He's been banned from the caves and humiliated by being made to work with the women. Deer needs to get back into the cave to paint. He also wants to become the mate of Moon, the daughter of the Keeper of the Horses, who paints horses in the caves. But he has a rival... The Keeper of the Bulls who is rapidly becoming the most powerful man in the tribe. Somehow or other he needs to solve these two problems, but how? Three allied soldiers are working with The French Resistance in 1944, an Englishman, 'Capitaine' Manners, Phillp Manners' father, an American, McPhee, and Francois Malrand a Frenchman with a future in politics. Their job is sabotage, the teaching of it to resistance fighters. It's testing and dangerous and made much more so by the rivalry of the various factions within The Resistance. Gaullists (as in General de Gaulle), communists, Spanish fighters who fled the Spanish revolution in the 1930s, all are vying for superiority and have plans to be the dominant force after the war is over. Manners is the peace-keeper, the one with the tricky task of preventing them from killing each other rather than the Germans. His main objective though is to stop the German Das Reich division from travelling north to help stop the imminent allied invasion. In order to achieve this aim he sometimes has to make some terrible decisions. This book could well be vying for best book of the year for me. It really is superb. I'm sometimes not a fan of a story told from different points in history. I find you no sooner get interested in what's being told about one person's story than it comes to an abrupt end and you're swept off somewhere else with a whole new set of characters to try and remember. Here though it worked very well. The sections were not short and 'bitty' but quite long and came to a natural conclusion. The most difficult part to write must've been that of Deer and Moon in 15,000BC as we don't really know much about the cave artists, but it's very well done, a realistic scenario I thought, and I loved the panoramic feel to these sections with gorgeous descriptions of the landscape of southern France. There are deaths in this story but it's not at all a 'murder' mystery. It's a mystery about who stole the cave art, where is it, and where did it come from in the first place. I found the history fascinating and everyone's story excellent, the weakest, for my money, being the modern-day one. That had plenty of interest but I didn't feel the romantic aspect worked fantastically well. This is nit-picking... this is a jolly good book and I truly wish there were more around like it. 43. Gardens of Stone - Stephen Grady. WW2, the story of a teenage boy in the French Resistance, non-fiction book. 44. The 12.30 From Croydon - Freeman Wills Crofts. Unusual vintage crime story. 45. The Natural History of Dragons - Marie Brennan. 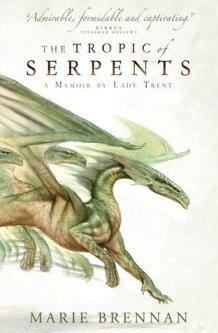 Part one of a fantasy series that portrays dragons as real. 46. 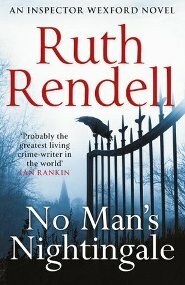 No Man's Nightingale - Ruth Rendall. An excellent Inspector Wexford crime yarn about the death of a female vicar. 47. 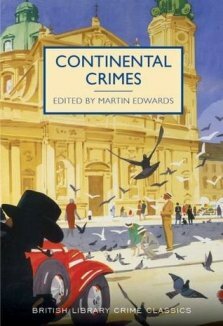 Continental Crimes - edited by Martin Edwards. An anthology of short vintage crime stories. 48. Cruel Crossing - Edward Stourton. How the French Resistance helped escapees from Nazi Germany and allied airmen escape into Spain via The Pyrenees. 49. 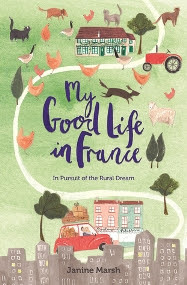 My Good Life in France - Janine Marsh. Non-fiction... a British couple buy a wreck of a house in France and settle there. 50. The Caves of Périgord - Martin Walker. So, three non-fiction - a number I'm pleased with - and five fiction. Three decent crime books in there and one good fantasy novel which is a genre I've not read in quite a while. I need to rectify that as I do enjoy a good fantasy book and have quite a few on my tbr pile still. The three non-fictions were all excellent, all concerned France, and all got a five star rating from me on Goodreads. I haven't reviewed The Caves of Périgord by Martin Walker yet, but I will soon as it was so good. Both of these books were excellent reads, both concerned the history of the French Resistance to a greater or lesser extent, and both taught me an awful lot. And now here we are in September and autumn's on the way, my favourite time of year. Happy reading! A couple more French books today, both very different to each other but both got five star ratings from me on Goodreads due to their readability and that feeling that both authors had poured a lot of love and effort into their individual projects. 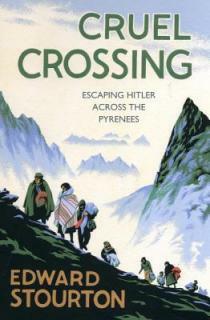 First up, Cruel Crossing: Escaping Hitler Across the Pyrenees by Edward Stourton. I knew that many refugees and escaped prisoners were helped out of France by the French Resistance during World War 2 but details of the route they took were sketchy in my head. I think I thought they all went through Switzerland or out via the south of France to Gibralter. And quite a few actually did but it seems many also went via various escape routes, The Pat Line, The Comet Line etc., which ran down through France to the Pyrenees and thus into Spain. The people helped included allied airmen who had been shot down over Germany, France or Belgium, persecuted Jews, resistance members for whom life had become too dangerous in France and so on. This non-fiction account tells the stories of so many very brave people that it would be impossible to recount them all here. Plus this not a book primarily about The Pyrennees, there's a lot more general information about the war and how it affected the French population. Vichy France is discussed in detail, colaboration... I had no idea there was a sort of offical French colaboration force in the south of France called The Milice. Many of the Resistance considered these people worse than the Germans. The author himself undertakes The Chemin de Liberté, one of the main escape routes over The Pyrenees, to get an idea of what it was like although it can never compare with having to do it in appalling weather, exhausted, with the threat of capture a constant threat. There isn't a lot about his walk though, mainly this is an excellent historical account of bravery in the face of appalling danger and cruelty. I gave this five stars on Goodreads as I learnt such a lot and it really is a very well written book. Next, My Good Life in France by Janine Marsh. Janine Marsh lives in London with her husband, Mark; she has a good, well paid job and no reason to move to another country. What she does do is pop regularly over to France on day trips to buy wine: it's only an hour and a half by ferry across the English Channel. On one of these forays, quite by accident really, they end up viewing several properties for sale and Janine falls in love with a wreck of a place in the Seven Valleys in Northern France. The couple buy it and set about renovating it, visiting every weekend they can manage. Then the recession arrives and Mark is made redundant. He drops the bombshell that he would like to move to France on a permanent basis. Janine is completely torn. 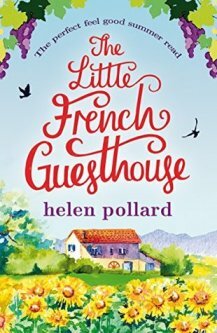 Half of her loves her job... she is about to be promoted... half of her is drawn to their little house in France and the way of life. What the heck is she going to do? Well, no prizes for guessing what the author decides to do and reading all about it was sheer delight. It's not an area where there are heaps of ex-pats so assimilating into the local village, becoming part of the community, was very necessary in order to survive. And, as I discovered when my late sister-in-law moved to France twenty years ago, the locals are nearly always very friendly. But you have to adapt to their ways, no use going there and expecting them to change for you. Why the heck should they? And, like us Brits, they have their quirks, especially when it comes to language, so many subtleties you need to learn because mistakes can be embarrassing. For instance if you're invited to a party, never ever turn up on time. It's considered rude... half an hour late is fine, two hours late is even better. And so on and so on. I thoroughly enjoyed this very personal look at the French way of life... how two hapless Brits managed to survive and fit into what sounds like a gorgeous area. Loved reading about their neighbours, their animals, their exploration of the area, it was all delightful. Janine Marsh's website, The Good Life in France is well worth a visit for all kinds of info and lovely pics. You can also follow her on Twitter or Facebook. Anyway, three books to review... first up, The Natural History of Dragons by Marie Brennan, this is my book 13 for Bev's Mount TBR 2017 challenge. Seven year old Isabella, Lady Trent, falls in love with dragons the day she finds a dead sparkling in the garden. It's an uphill struggle to study them, girls are not expected to do such things and she has to conspire with her brother in order to read books on the subject from her father's library. She can be her own worst enemy though and after a disastrous dragon hunt that she should not have been on, she's banned from studying and reading. Several 'grey years' pass and eventually Isabella meets Jacob Camherst, a scholar with an interest in dragons and the two marry. Isabella is able to recommence her studies. Then the opportunity to go on field trip to study dragon in the wild occurs, can she persuade her husband to take her along? 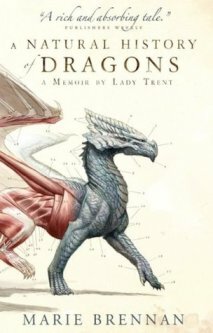 I thoroughly enjoyed this story of Lady Trent's early days as a studier of dragons - she's writing her memoirs in her later years when things have vastly improved for women who want to gain an education. I very much liked the style of the book which is that of a Victorian female explorer. Though this is not Victorian England it does feel very much like it, the country they travel to being perhaps Russia. It's well written, fun, and written exactly as though dragons were real and available for serious study. I liked it so much I already have book two, The Tropic of Serpents, on my tbr pile. Inspector Reg Wexford is now retired, still living in Kingsmarkham, and spending his retirement reading The Rise and Fall of the Roman Empire. His ex sidekick, DS Mike Burden, calls him in to help solve the murder of a local female vicar, Sarah Hussain, a woman of mixed parentage... she was half Irish, half Indian. She had a daughter, Clarissa, who doesn't know who her father is... could this be a clue to the murder? Wexford and Burden get very bogged down questioning Sarah's few friends and an old friend from her past. It doesn't seem as though anyone would've wanted her dead but someone strangled her in her own home. Burden declares that he is never interested in motive, just the facts, but Wexford feels that motive is the key to this and even when a man is arrested ploughs on with his own investigations. This is actually the first Inspector Wexford book I've read, although I did watch the TV series avidly years ago. It's also book 24, the last of the series Ruth Rendell wrote, so it was perhaps a bit mad of me to start reading the series with that one. That said, I don't think it matters in the slightest, probably *because* I'd seen and TV series and knew all of the characters well. I enjoyed this very much indeed, in fact I enjoyed it much more than I thought I would for some odd reason. So much wonderful dry humour in Wexford's thoughts and musings... and endless common sense. And more humour in the character of Wexford's cleaner, Maxine. She never stops talking, in the manner of people we all know, and is hilariously written. I loved Wexford's bookishness and the use of The Rise and Fall of the Roman Empire to illustrate various points. Clever. Because it was such a complicated little plot, I really didn't know until the end who had done the deed, so that's a plus. All in all an excellent read, superb writing, and I will definitely be grabbing more from the library when I have some space on my ticket! I always find it difficult to review volumes of short stories, sometimes I say something about every story but as life is short I shall just review the book in a general way. This is an excellent collection of stories set all over Europe but mainly France, Belgium, Germany and Italy. Many would come under the heading of 'Vintage Crime' being set in the 1920s & 30s but there are later ones from the 1950s and so on. Two, The New Catacomb by Arthur Conan Doyle and The Secret Garden by G.K. Chesterton, I had read before. The former I thought was clever and well written, the latter I didn't read again as I hadn't been that impressed with it first time even though I do like Father Brown stories in general. Not all are actual murder stories - the title doesn't actually promise that anyway - and that's no bad thing. One of my favourites, Petit Jean by Ian Hay, was more of a war story, set in World War One. How an author could make such a story funny I've no idea, but he did and it was an excellent little intrigue yarn which actually made me giggle all the way through. I'd happily read more by this author. A couple of others I enjoyed - The Room in the Tower by J. Jefferson Farjeon (I read his Mystery in White last Christmas), which was a supernatural story set in a castle on the Rhine, and The Ten Franc Counter by H. de vere Stacpoole, a murder mystery set in Monte Carlo. Both were well written and enjoyable. Agatha Christie's offering, Have You Got Everything You Want?, is a 'Parker Pyne' story about some stolen jewels. This is one of Christie's recurrent characters that I'd not come across before, which is perhaps not surprising as there seems to be just one book of short stories and apparently they're not all mysteries. The Long Dinner by H.C. Bailey was one of those kinds of stories you feel like giving up on but come the end you're glad you didn't. It hoicks the reader all over the place from Paris, to Devon in the UK and then back to France and the coast of Brittany. Excellent story that starts out as one thing and ends up as something else entirely. Like all anthologies, Continental Crimes has its high points and its low points but taken as a complete collection I thought it was rather good and have discovered several authors I would like to read more of. A quick catching up post today, two books to review... I was going to say, 'very different' but there is actually a connection: both books take place in the 1930s (the first one goes on into the 1940s too of course) and very much reflect those very difficult times. 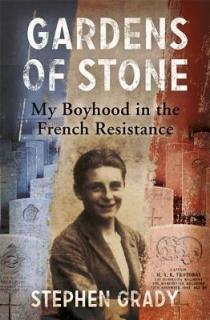 First up, Gardens of Stone: My Boyhood in the French Resistance by Stephen Grady and Michael Wright. Stephen Grady was born in 1925 in Northern France, very close to the Belgian border. His father was English, his mother French - they had met during the First World War. Mother and father, four children, grandma and an aunt all lived together in a two bedroomed house in the village of Nieppe. Stephen's father worked for the Imperial War Graves Commission tending several WW1 cemetaries in the area. Stephen is 13 when war breaks out... the evacuation of Dunkirk affects the family badly and when the Germans invade France Stephen's father, being English, has to go into hiding. Stephen is rather adventurous and wild and because of a prank with another boy ends up in the notorious Loos prison, sharing a cell with three adults. Surviving this he joins the Resistance in 1941 and begins a very dangerous existance of secrets and sabotage which sets him apart from his family. When I started reading about France three months ago I didn't think that my reading would lead me to books about the French Resistance. I got here via a couple of crime books, but principally Jacquot and the Angel by Martin O'Brien which dealt quite a lot with the French Resistance in the south of France during World War Two. It piqued my interest. I saw mention of Gardens of Stone on Goodreads and decided to order it from Amazon. So glad I did. I usually take longer to read non-fiction and thought this would be no different. Wrong. I whizzed through it, partly because the writing was so accessible (author, Michael Wright, actually wrote the book I believe) but also it really was absolutely fascinating. I'm not really a war story sort of a person but this gripped me from the start and didn't let go. The author recounts his wartime experiences in a very matter of fact way, given he was only a teenager at the time, the triumphs, the tragedies, the fear, it's all there. Some of it makes for difficult reading, betrayal to the Germans by neighbours was rife, but also it was incredibly uplifting to read what very ordinary people were capable on in the way of bravery. Stephen's resistance 'job' was to test allied airmen stranded in France to make sure they were not German spies, because English was his first language. But he also took part in sabotage missions, doing things that no young person should ever have to do. One particular event scarred him for life. An amazing book, one I would wholeheartedly recommend to anyone with an interest in the history of the second world war. 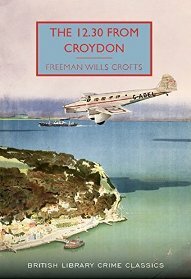 Lastly, The 12.30 From Croydon by Freeman Wills Crofts. So here we have a murder mystery written, not from the point of view of the police officers who investigate the murder, but from the viewpoint of the man who does the deed. I don't think I've read one like this before, it was absolutely fascinating. We get the whole plan from start to finish and it's very strange because although Charles is really not a very likeable person you do find yourself 'almost' hoping he gets away with it. Note that I'm not saying whether or not he does... The tendancy is to think Charles is every bit as clever as he thinks he is, forgetting all the other crime books you've read where the police are not as stupid as the perpetrator assumes. Very clever stuff and I enjoyed this one very much. My only misgiving is a personal one, I don't care for court room dramas and for the last 100 pgs or so that's what this book becomes, so it lost a bit of its interest then for me. *But* another cracking BLCC book... which I highly recommend to lovers of Vintage Crime. I have to admit, July is not my favourite month of the year. In fact it's my least favourite. It can sometimes be too hot, even in the UK ha ha, and I hate that. Thankfully, July 2017 has not been too awful, just a few odd days in a row where it's been, for me, uncomfortably hot. At the moment we have cool temps. with some sunshine, many showers, weather you can get on and work in. The garden's going well, we're harvesting raspberries, plums, courgettes, runner beans, carrots and so forth. Tomatoes are just coming in. The shallot crop was large and those have been dealt with gradually over the last week, either frozen or pickled. I feel a certain sense of achievement in respect of the last month despite the fact that I hate July! Crazy, but there you go. So, a motley bunch. Two non-fictions, both good. Three crime yarns, a rom com, a couple of classics from Jerome K. Jerome. Three books set in France so that fascination's been with me for three months now (it started in early May) and shows no sign whatsoever of abating. Which is fine as I'm learning rather a lot... I'm now reading about The French Resistance during WW2... and knowledge never goes to waste. I'm having trouble choosing a favourite book. 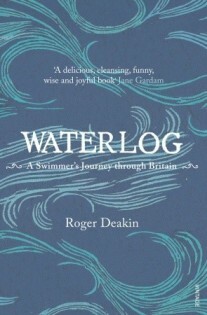 The only one here that I gave a five star rating to on Goodreads is Waterlog by Roger Deakin. And it was indeed superb. Beautifully written and a book to immerse yourself in , no pun intend... oh, ok then perhaps I did mean it. ;-) But really if I think about these seven books, the one that's stayed with me is Peter May's The Critic. It was so very French in its descriptions of wine making in the South of France, so much atmosphere and so very clever with its plotting. I should go back and give it a five on Goodreads rather than a four to be honest. Peter May is such a good writer and I haven't read anything by him that I haven't liked a lot. More French books. Quelle surprise! Not. Anyway, three very different books. 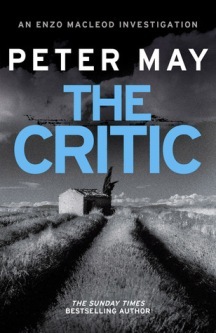 First, The Critic by Peter May - my book 3 for Peggy's Read Scotland 2017 challenge. American wine critic, Gil Petty, has been murdered, his body pickled in wine, dressed in ceremonial robes, and strung up scarecrow-wise in a vineyard in the Gaillac region of the south of France. This happened several years ago and it's yet another unsolved case for Scot, Enzo McCleod, who is trying to solve seven unsolved murders from a book by an acquaintance. As a critic, Petty had a lot of influence over what sold throughout the world in the way of wine. He was also not the pleasantist of people and Enzo suspects he had more than a few enemies. But then another body, similarly pickled and strung up, is discovered and there appears to be no connection between the two men. A code needs to be broken before this distressing case can be solved but are Enzo and his team of Nicole, Sophie and Bertrand, and Charlotte up to the task? Another enjoyable foray into the world of Enzo McCleod in the south of France. In this one wine-making plays a huge part. I would almost say if you fancy going to France to take it up, read this book! To be honest there's a little too much detail but it did make me consider the power these critics have over people's lives, be it wine, food, hotels or whatever. You can understand the resentment hard working people must feel towards them. I like the team Enzo has around him, particularly Nicole the clever student from a very poor farming background. Her problems feel very real. Not so sure about the on/off girlfriend, Charlotte. And here's yet another male author writing a middle-aged main character who's apparently completely irrestible to much younger women... Anyway despite this I do like this series... it's well written, the murders are always complicated and thus hard to solve, and Peter May really does do 'France' very well indeed. I shall read more. 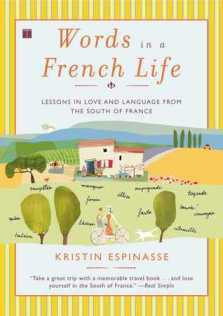 Kristin Espinasse is an American woman from Arizona who married a Frenchman and moved to the South of France. She thought she could speak reasonable French having always had an intense love of the country and studied the language extensively. But real French, spoken by real people, is quite a different animal to that which we're all taught in the classroom and Kristen found her language skills somewhat wanting. 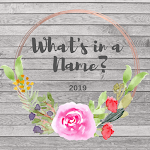 She started a blog, French Word a Day, in which she introduces her readers to new words and illustrates them with daily happenings in her own life with her family in Provence. I found this utterly charming. All the vagaries of French life are here, I wondered at how similar we all are with our worries and concerns for our families but also... how different with our little idiosyncrasies, our taboos, and so on. I loved hearing about her husband and children... who helped her a lot with her French as they grew... her friends and most of all the area in which she lived, which sounds rather idyllic. The book, I should add, also informs and I felt I learnt quite a lot, but in a gentle way... the best way in my opinion. Emmy and her boyfriend, Nathan, are on holiday in the Loire Valley, staying at a guesthouse, La Cour des Roses, owned by British ex-pats, Rupert and Gloria. Rupert has a sudden seizure in the kitchen one night and Emmy rushes off to find Gloria, his wife, and finds her and Nathan in a compromising position. Next day Nathan leaves with Gloria leaving Emmy to look after Rupert, just out of hospital. She stays to help him run the guesthouse and very quickly grows to love everything about the place and loves the new friends she meets. But she has a good job back in England, friends, family... she can't possibly stay... can she? I don't read heaps of these romantic comedy type books but I do enjoy the occasional one, especially if it happens to be set in France as this one is. And here the setting is particulary well depicted. La Cour des Roses sounds absolutely idyllic, as does the village and surrounding Loire countryside. Well drawn characters add to the enjoyment, I liked Rupert, Alain and Sophie, but particularly loved the French woman who came to clean whose name eludes me - possibly 'Madame Dupont'. I will admit to a few moments when I felt like shaking Emmy, and as to her ex-boyfriend, well... Anyway, thoroughly enjoyable and there are two more books which I'll search out in due course. So, here we are almost at the end of yet another month. Scary. It's already feeling autumnal, a fact which I don't mind in the slightest as autumn's my favourite time of year. Happy reading! To be honest I wasn't at all sure what to make of this. It was a fun murder mystery, I will say that, with a really nice setting on the island of Sicily. Nice sense of place and of the eccentricities of the inhabitants of that island. The problem for me, I think, was that I felt the author made Aunt Poldi just a bit too eccentric. I do actually like a bit of weirdness here and there, enjoy it in fact, but I almost felt the author had gone overboard just for the sake of it. I struggled to identify with Poldi and that's a shame as middle-aged female protagonists are very few and far between. I say 'middle-aged'... the author refers to her as 'elderly' and she's in her sixties... like me... I do not think of myself as 'elderly'! Surely these days elderly is late eighties or ninety. Anyhow, hit and miss with this book I think, but cheap to buy on Kindle and a fun read so I have no complaints whatsoever. A young man, Nené Sanfilippo, is shot dead outside his block of flats in Vigata, Sicily. 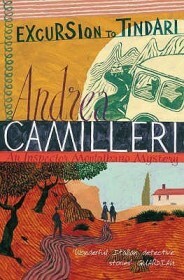 Inspector Montalbano and his team are assigned the case. Then another man turns up at the police station, very worried about his parents, Mr. & Mrs. Griffo, who have not answered their phone for several days. Montalbano naturally makes no connection between these two occurrences... *until* he finds that the murdered man and the missing couple lived in the same appartment block. It turns out that the Griffos were last seen on a coach which was taking its passengers on an excursion to the Sanctuary of the Madonna in Tindari. On the way back the coach stopped for a comfort break and no one remembers seeing them after that. Then a local Mafia chief asks to meet up with Montalbano. What on earth is going on? Another enjoyable episode in the detecting life of Salvo Montalbano... number five as a matter of fact. I can't claim that this is one of my favourite series, because it's not. I like them, I don't love them, and I'm not sure why that is. 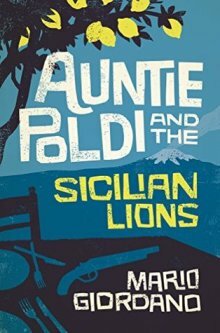 I do enjoy the taste of Sicilian life the author brings to his stories. The island is very real... the people, their addiction to food, the history, the oppressive heat, the organised crime, the eccentricity of the police force. There's a good natured, earthy humour I like and Montalbano's love of good food is endearing. His love life not quite so much. I read these books very intermittently, so as there're are rather a lot it'll take me while to get through them. But that's ok, I have several series I read like that, dipping in and out when the mood takes me. It's all good. Two watery books today. First, Waterlog by Roger Deakin. He actually started his journey in the Isles of Scilly, off Cornwall, and thence into Cornwall itself. 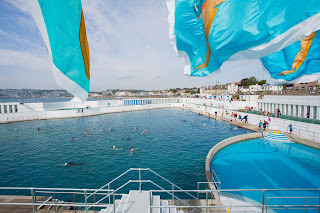 I was particulary interested in his swim in the outdoor lido in Penzance because this is where I swam as a child. The pool has recently been refurbished after being virtually destroyed by yet another Atlantic storm. Its triangular shape is apparently unique in the UK, something I didn't realise. After that he swum all over the place, a lot in East Anglia as previously mentioned but also Scotland, Devon and Dorset, Sark in the Channel Islands, the Leeds & Liverpool canal, Lidos in London, remote mountain lakes in Wales, to name but a few. It's quite hard to review books like this which meander almost as much as the rivers Deakin was swimming in. That's because his thoughts on all kinds of things take up as many pages as the actual swimming. We get a lot of history, topography, and musings on all kinds of topics, plus interesting bits on the people he meets, things that have happened to them and so on. The book is fascinating... it took me a month to read and I'm quite pleased about that as it meant I could savour it in detail and enjoy the wonderful laid back, contemplative nature it exudes. The sad thing is Roger Deakin died in 2006 aged 63. A sad loss to British nature writing. 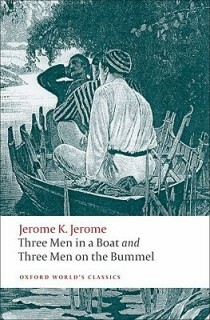 Three Men in a Boat hardly needs any introduction from me. This is my second or even third time of reading it, although I did't own it. Not even sure what did happen to my copy but when I saw this lovely Oxford World Classics edition advertised by them on Twitter I decided it was time for a reread and this was the one I wanted to read. It involves of course, three men, Henry, George and the narrator 'J', deciding to row up the river Thames from Kingston to Oxford, along with the dog, a fox terrier, Montmorency. It catalogues their fictional adventures and misfortunes, their ineptness despite them all being men who've been out on boats on various rivers in the past. What struck me was what a popular pastime 'messing about on the river' was back in the 1890s when this book was written. It was crazy popular, not so much for the pleasure it seemed to me, but for the act of being seen out and about and taking part. The river could get so crowded at the weekends it could take hours to get through particular locks of which there are many on The Thames. Of course, the joy of this book is not necessarily the boat trip itself. It's the author's cogitations on everything under the sun. Hilarious stuff so beautifully put that it had me it fits of laughter. And I loved how self-deluded the narrator is when it comes to his own character. To be honest he's deluded about *most* things. The book is a joy, if you haven't read it, please do, you won't regret it. One parallel I must draw between Waterlog and Three Men in a Boat is that both sets of travellers found access to some parts of the rivers difficult due to private ownership and *signs* up all over the place. It drove Roger Deakin mad and also the three men in the boat. You might have thought things would've improved in a hundred years but no, apparently *not*. Interesting. I'll be reading the second book, Three Men on the Bummel very soon... think I've already read that too but honestly don't remember it so I'm hoping it too will be a joy. We're now more than halfway through the year so it's time for the 2nd. Mount TBR checkpoint. 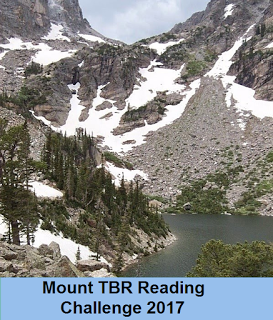 I signed up originally for Pike's Peak which is to read 12 books off your TBR pile. A. Choose two titles from the books you've read so far that have a common link. You decide what the link is--both have strong female lead characters? Each focuses on a diabolical plot to take over the world? Blue covers? About weddings? Find your link and tell us what it is. My link is between Bill Oddie Unplucked by Bill Oddie and Waterlog by Roger Deakin. And the link is both authors' love of wildlife, in Oddie's case specifically 'birds'. It shines like a beacon out of both books and is delightful to read and learn from. Use titles from your list to complete as many of the following sentences below as you can. If you haven't read enough books to give you good choices, then feel free to use any books yet to be read from your piles. I've given my answers as examples. Feel free to add or change words (such as "a" or "the" or others that clarify) as needed. So, onwards and upwards... Mont Blanc! Well, here we are... six months into 2017 and it's downhill all the way to Christmas. *Dodges sundry rotten veg* I wanted to pop an update on the Where Are You reading? challenge up here, mainly for own benefit so I don't have to go too far back when updating it. Also it's one I like keeping an eye on as I'm enjoying it quite a bit. 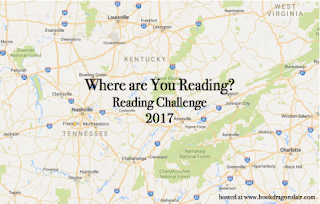 The sign up post is here: Where are you Reading? and is being hosted by Book Dragon's Lair. 1. You can list your books in advance or as you read them. You can also change your list. 2. Any format, any genre or length of book counts but it must be the complete book, individual books in a collection do not count separately. 3. Anyone can join, you don’t need to be a blogger, just let me know in the comments. 4. Reviews are not necessary but a list of books you read is. There will be a link up for reviews if you wish to post them. You can make a list of books you want to read and change them if you'd like. 5. Crossovers for other challenges count. Sooooo, that's 18 letters filled, 8 to go. I have books to cover a few of the vacant letters, B, G and H for instance, and probably others if I care to search properly amongst the TBR mountain. Quite pleased with some of the destinations... various lovely US States, nice parts of France, Canada, Scotland, England and so on. Possibly I should vary the countries a bit more but those are the places I like reading about so it's a very much a list which reflects me and I can't think that that's really such a bad thing.